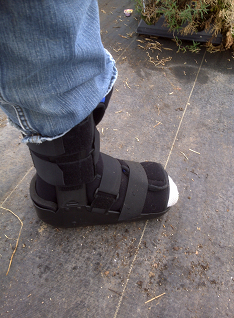 Here’s the latest in Fahrmeier Farm Fashion. This boot is a part of our Spring 2011 line. We like it because it’s versatile for indoor and outdoor usage. It comes in black and only black…which is fine because everyone knows that black goes with everything! So here’s what really happened... Real life work happens on real life farms like ours. Yesterday, Bret and Ron were fixing a broken waterline. Everything went well in fixing the line until after that job was complete. Bret was doing some watering in the greenhouse when he noticed the pressure was a little low. He headed up to the winery production facility to check to make sure all the water was turned back on and working at the appropriate levels. As he jumped into one of the pits his foot slipped on a piece of misplaced PVC pipe. Sending him flying in the air like a scene from the movie “Home Alone” and leaving him with a severe sprain and this cool looking boot that he gets to sport for a couple weeks. The good news is that you can’t keep a good man down and time is ticking to get the rest of the seeds planted for our growing season. During the winter we get to experiment in the kitchen a lot more than in the busy summers. Plus cooking is one our favorite ways to spend time together as a family. Whether it’s a meal for two or 10, spending time in the kitchen means valuable time. A couple weeks ago we hosted a going away dinner for a close family friend of ours, Justin, who actually left today for basic training for the United States Army. When planning this special dinner, I wanted to make something familiar yet special and this recipe certainly did the trick! Plus there comes a point in time during the winter months that you just can’t handle cooking ANOTHER pot of soup. We like it but there is such a thing of too much of a good thing. Being the “foodie’s” that we tend to be, I saw this recipe being prepared on the Food Network by none other than the super dreamy, bongo playing Matthew McConaughey. Yes, someone that has a more complicated last name than Fahrmeier! It’s called JKL Pork Loin- JKL standing for Just Keep Livin’. I made a few amendments to suit our taste buds and it turned out really tasty! Check it out below and make it for a special dinner soon. It truly was a snap to make and the lack of leftovers was a sure sign of a new family favorite too. Thanks to Justin and the all of the other service men and women for making the choice to defend our freedoms! Also, here's a pic of the loin heading into the oven. We were so eager to eat it when it came out that we forgot to take and after photo too. In a mortar and pestle or a small food processor, combine the garlic, 2 teaspoons coarse sea salt, 2 teaspoons black pepper, cayenne, rosemary, olive oil and sugar and pound together until a thick paste forms. 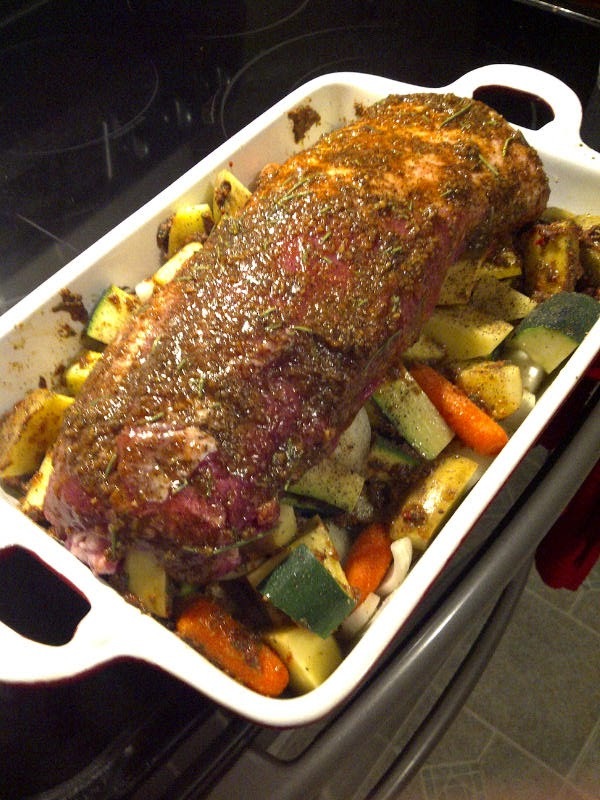 Rub evenly over the pork roast. It wouldn't be life on the farm if we didn't have a few setbacks every once in a while. After all, it is just like I said- LIFE ON THE FARM! We can only plan so much. For example, we laid field tile back in early December to help us increase our growing abilities in our tunnels, we cleaned up in and around our packing shed, replaced a water line, ordered seeds and planted them in the greenhouse too. All was going as planned until yesterday when the hot water heater in our greenhouse decided to hibernate...for the rest of its life. Without the heater our seedlings won't grow which in turn won't allow us to have an early crop of fresh vegetables or a crop at all for that matter. The cool thing about being farmers is that we are used to ever changing situations and making the best of what we have at hand. After trying to bring the old heater back to life, we made the decision to replace the heater so we could get back on track. With that, tonight the seedlings are tucked away in warmer conditions so they can continue to grow into healthy vegetables to enjoy and sell to our customers. If you're interested in trying our vegetables I might suggest that you purchase a CSA share from our farm. Its a great way to try the variety of crops we grow. Here's a link to the information. Baby It's Cold Outside... Better Start Planning for CSA's! 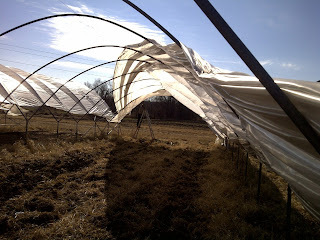 Well we survived another hectic holiday season and it's time to start preparing for our Spring planting schedule. Last year was our first year of selling CSA shares. Oh what a learning experience that was but while we were learning we also had a lot of fun getting to know our cool customers so we decided to offer it again this year. For those of you who aren't familiar with a CSA, it stands for Community Supported Agriculture, and it's an great way to buy local, fresh fruits and vegetables from farmers directly. We enjoy the program because it gives us the chance to get to know our customers and it allows us to educate more people about what we are passionate about... Agriculture. The Local Harvest website is an excellent resource to help you find a farmer in your area. Of course if you live in the greater Kansas City area we'd love for you to consider purchasing a CSA from us! Here is a link to our 2011 contract if you're interested. Cheers to a great New Year ahead! We’re just doing a little “bed time” prayer around here. 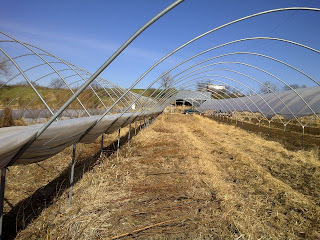 While we enjoy having a break in the winter, it’s always kind of bittersweet to take the high tunnels down in the fall. By the end of the week, all tunnels will be “put to bed” for the winter, all crops will be taken out, the soil will be worked and cover crops will be planted. Since it’s close to Thanksgiving, we always like to remember the things we are thankful for this time of year. Thankful for a bountiful crop, our great customers, the hard working field laborers and our strong able bodies, that by the way really need a good message right now... Here are a couple shots of the empty tunnels. At least we've had beautiful weather to work outside in. Oh how we’ll miss those tomatoes! Fall is one of our favorite times of the year here. It means one, that we survived another growing season (praise the Lord!) two, we can slow down a little from the long last few months and three, it’s getting cooler outside so it’s time to bake and cook! Let’s face it, there’s nothing better than a house filled with the aroma of fresh baked goodies. Halloween marks the end of pumpkin season for us and in usual Fahrmeier tradition; we must try a new different recipe using our bounty of produce. We made a stew in one of our pumpkins and used other homegrown ingredients for the stew. While at first I admit, I thought it was going to be a pain. Much to my surprise and Bret’s pleasure it was lots of fun and the end result was very delightful! We shared this pumpkin stew treat with family and needless to say, they were impressed! We found that the pumpkin adds creaminess to the stew and to boot it didn’t add any extra fat. Give it a shot, especially if you have left over pumpkins that need to be put to use. I added some thyme and a little extra garlic to our stew. Here’s a shot of the beauty baking in our oven- thank you GE for baking it to perfection! • In a Dutch oven, brown meat in 2 tablespoons oil. Add water, potatoes, carrots, green pepper, garlic, onion, salt and pepper. Cover and simmer for 2 hours. Stir in bouillon and tomatoes. Wash pumpkin; cut to 6 to 8 in. circle around top stem. Remove top and set aside; discard seeds and loosen fibers from inside. • Place pumpkin in a shallow sturdy baking pan. Spoon stew into pumpkin and replace top. Brush outside of pumpkin with remaining oil. 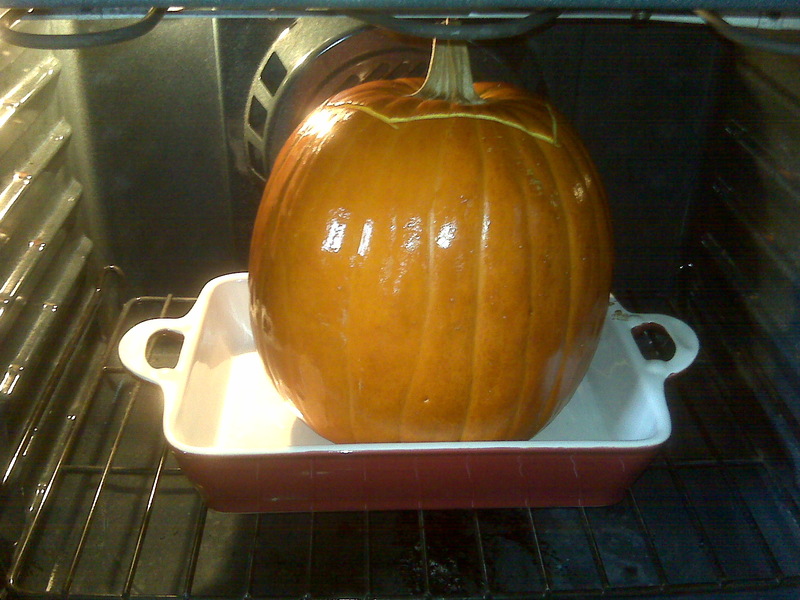 Bake at 325° for 2 hours or just until the pumpkin is tender (do not overbake). Serve stew from pumpkin, scooping out a little pumpkin with each serving. Yield: 8-10 servings. Food and Wine Festival Recipe! We hosted a food and wine festival at our farm a couple weeks back where we did a cooking demo. The demo was focused on busy day meals to fix but still feel kind of fancy having it with some yummy Missouri Wine.We paired our Norton with a simple beef stroganoff recipe that is a snap to put together. Here’s the recipe- enjoy! In a large skillet, sauté mushrooms and onions in a little olive oil. Once they are soft add in garlic, wine and beef tips. Let cook for 5 minutes over medium heat. Add in soup and sour cream. Combine until all ingredients are warm throughout. Add salt, pepper and thyme at the end for seasoning. Let simmer for a couple more minutes. Serve over rice or egg noodles. Simple and oh so good for cool nights!